(Lake George, New York)- The 40th annual Changing of the Colors is now on the books. Light and variable conditions on Saturday (winds 0-11, prevailing from NW) afforded the 29-boat fleet three races on Saturday. Sunday brought cloudy skies and steadier breeze from the South, and 4 races were sailed. Lots of shake-ups in the standings and pin-end pileups created plenty of excitement and uncertainty leading up to the final race. 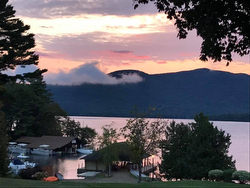 Nevertheless, it was yet another gorgeous, picturesque weekend on the gorgeous Lake George, with racing hosted by the Lake George Club. In the end, the two protagonists that started out the first day essentially tied, ended up that way at the end of the regatta. No question, it was a titanic duel between long-time J/24 legends in the class- Travis Odenbach’s HONEYBADGER crew from upstate New York and Carter White’s YOUREGATTA.COM crew from Portland, ME. Between the two boats, they took 11 podium finishes of a possible 21 total. Odenbach’s HONEYBADGER crew got the better of them, winning the regatta by just one point over White’s YOUREGATTA.COM team. A country mile behind them on points it was yet another battle for the balance of the podium and the top five. In that four-way battle, it was Alfie Merchant’s WITCH WAY, Ed Rees’ A+SALT, David Kaye’s ELLE, and Mike Quaid’s ICE CUBE. In the final tally, it was WITCH WAY that took the bronze with 39 pts net. They were followed by Rees’ A+SALT in fourth and Kaye’s ELLE in fifth (winning the tiebreaker at 49 pts net each over ICE CUBE). Follow the J/24 Changing of the Colors Regatta on Facebook here For J/24 Changing of the Colors Regatta scorelines For more J/24 Changing of the Colors Regatta sailing information Add to Flipboard Magazine.